The book Golden Age of Enduros has 320 pages and contains 11 chapters with approximately 100 old photos and an appendix containing 70 pages of selected results from enduros – mostly in New England, but also from other areas including national championships. The book has an Introduction by Ed Youngblood, a well-known author, past president of the American Motorcyclist Association and current owner of the popular website on motorcycling history, http://motohistory.net. The following excerpt is from Chapter One of Golden Age of Enduros, which describes riding a stripped-down 1947 Harley Davidson 74 OHV with a 19" vintage car tire on the front and a 6:00-16 snow tire on the rear in my first enduro in 1948 (see the photo below). I went on from there to compete in enduros for six decades, winning trophies in all but this first one. “I rode my stripped-down Harley the 27 miles to Yonkers for the meeting. Most riders came by car for that meeting, but I didn’t own a car. Each rider’s name was called, one at a time, and they would come forward to draw their starting positions from a huge bowl. Route sheets were given out at the same time. I decided to tape mine onto the gas tank when I got home. The route sheet held the details about the run, like the cumulative mileage to each turn on the planned course. Bill Tracey was the master of ceremonies at the dinner and when he called my name to come forward and draw a number, it was not without fanfare, especially after he made a point of announcing (while laughing) that everyone should take a good look at this guy, because “He’s the dark horse in this run.” I learned that the winner would take home a 15-pound turkey along with the largest trophy. The drawing and the run were held shortly before Thanksgiving. I got to see several of the local favorites at the dinner, including Don Pink, Phil Phillips, Warren “Specky” Sherwood, Rod Coates, and others. Occasionally riders would come from great distances to compete in the Yonkers endurance runs. I remember seeing the names Al and Julie Kroeger from upstate New York on the result sheets of that and other Yonkers runs. I learned that they were well-known national endurance run riders. Having a dinner like that was a really great way to get acquainted and to develop lifelong friendships with many of the other riders. I learned many years later that a similar pre-event dinner was held every year on the eve of the famous two-day, 500-mile National Jack Pine Endurance Run in Michigan. On the morning of the run I again rode my Harley the 27 miles to Yonkers, which was a chilly ride without a windshield. I had drawn a starting position that was just about in the middle of the pack. I think there was a total of 30 riders that started across Broadway from Tracey’s shop that morning. The route sheet took us over a few miles of paved roads to get out of the city and into the first trail section, which was called Ardsley Woods. There were more than a half-dozen contestants on much smaller motorcycles than mine already stuck in the mud. A few of them were buried to beyond their axles in deep muddy water. At least one had drowned out his engine. I paused for a few moments, contemplating the possible routes through it. As I sat mesmerized, watching the excitement, I saw Phil Phillips ride up to the edge of the mud with his 350 cc Panther. He hesitated only briefly to choose his route before making it non-stop all the way across, using both his feet for paddles in the muddy water. He seemed to make the crossing with a minimum of effort. It didn’t look that difficult to me, so from my position about 10 feet from the edge, I grabbed a big handful of throttle, braced myself and headed straight for the same track that Phil took. With the momentum I had built up, I managed to get almost halfway across the swamp; but the 600+ pounds of iron simply buried itself in the mud as the engine stalled. There must have been 20 or more spectators standing around cheering – and a few laughing. A couple of them jumped in to try and help me to get the big Harley out, but it was almost to a point where you might say, “forget it!” It wouldn’t budge an inch. Even getting it restarted was a chore because I couldn’t get full travel out of the kick-starter. Spinning the back wheel didn’t help at all because the center was hung up on something. While I was in the mud hole I saw Don Pink come through with his Harley 45 WLDR. His movements were smooth as silk as he made the crossing look far easier than it was – to me, anyway. After spending the better part of an hour struggling with it, several other spectators jumped in to help get my Harley out. It took about five people pulling and pushing with all of their might, with help from the engine. I was well “over my hour” when I reached the checkpoint on the far side of the swamp, which meant that I was disqualified from the event for having reached that point more than an hour late. So from there I simply went home, which was a short 10-mile ride from Yorktown over paved roads. I got the results in the mail a week or so later and I don’t recall now who finally took home the turkey. The photo below goes along with the text above and also appears in the book: Many of the other photos shown in the book are also posted elsewhere in this blog under "Enduros and Trail Riding." “In February 1965, at the Connecticut Ramblers Snow Run, held annually at Warehouse Point, I was invited to join the RAMS Motorcycle Club of New England. I felt honored by the offer and I accepted. Club competition in New England had become quite popular and the RAMS hoped that I would shore up their team effort. From a personal standpoint, I felt as though the group that I had been riding with and competing against for so long had finally accepted me. I’m sure some members still had mixed emotions about my joining, since I would become eligible to compete for the annual enduro championship, possibly depriving someone of a place in the final standings; but there was a vote and I was voted in, which I considered to be a show of excellent sportsmanship. Christy Scholar said at the time that the RAMS acronym stood for Rider’s Actions Means Sportsmanship. Christy and Jim Stebbins, both riding 500 Matchless, and Phil Bourdon with a 500 Triumph, were among the RAMS club members who figured high in annual heavyweight championship competition, and would have the most to lose. I was immediately assigned to the RAMS #1 Team, which was later to became not only the top club team in New England, but also one of the top club teams on the continent. The New London M.C. team of Don Cutler, Bill Perry and Al Semmelrock was the team to beat in New England at the time. Bill Perry had already been named the 1964 Enduro Grand Champion, riding a Greeves. 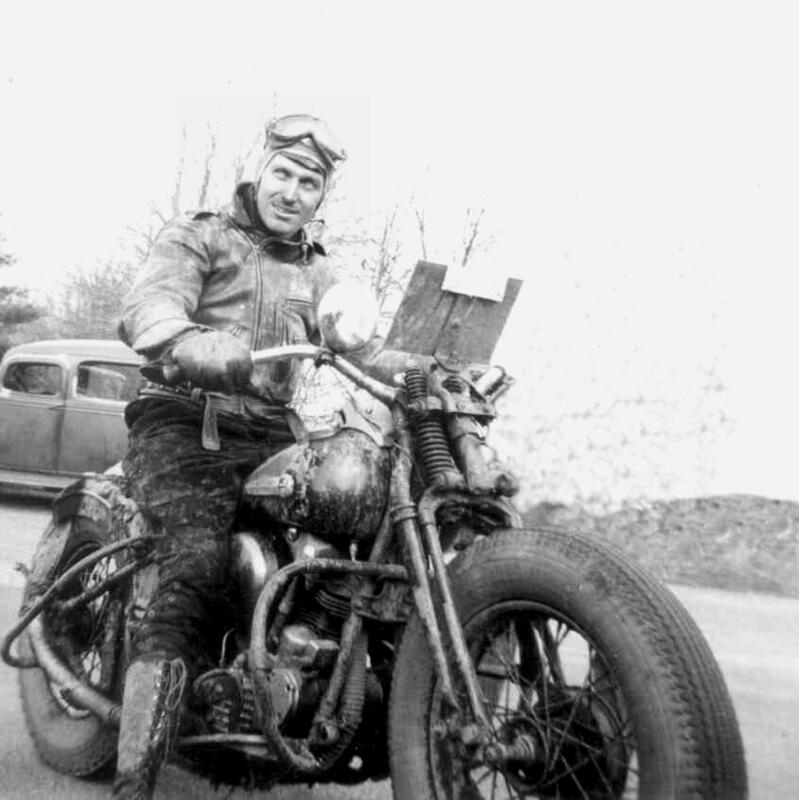 Don Cutler won the heavyweight championship that year on a Triumph and was second overall for the grand championship. Al Semmelrock finished 2nd in the expert heavyweight class on a BSA. The three continued their winning ways in club competition during 1965, in spite of my contribution to the RAMS effort. When I began to compete for the individual enduro championship, Don Cutler was my most formidable rival. 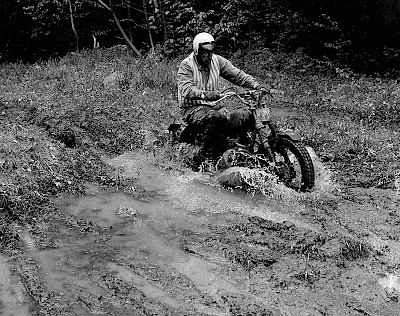 He was not only a top enduro rider, but he had also, since 1962, finished high in both the scrambles and trials championships. In 1962 he won the Class B Heavyweight Championship in both enduro and scrambles competition. Known as the Quiet Man, because he didn’t say much, Don’s silence was a sign of genuine modesty. That silence, as well as his physical size and slight build was deceiving, as he was an outstanding natural rider with a mastery of both the stand-up riding style and balance. Don Cutler was an excellent off-road motorcycle rider in every aspect of the sport. 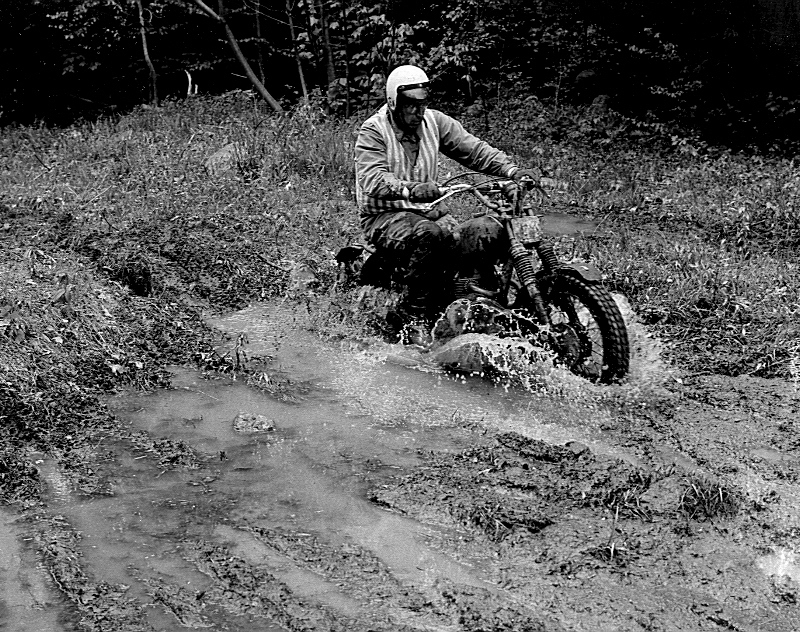 During 1963 Don was selected to ride on the prestigious New England Scrambles team against the Canadians at Grafton, VT; although later, soon after having been involved in the same serious scrambles accident that took the life of a very popular rider of that era, Babe Aldo, Don began to concentrate more on riding the enduros – and he became exceptionally good at it. In 1965, which was my first year of competing for the annual championship in New England, Don won the overall title, while I won the heavyweight championship. It was the first time that the overall grand championship went to a heavyweight rider since Charlie Schumitz won it back in 1959. After winning the championship, Don also eased off from his enduro riding to heal a painful pinched nerve in his shoulder. He returned to full-time enduro competition four years later at the Salmon River Ramble in December 1969, riding an Ossa Pioneer, and he won that exceptionally tough event. He immediately went on to win two more consecutive high scores in the Snow Run and in the Lost Hour enduro.